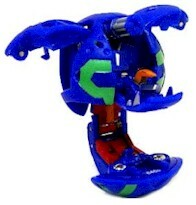 Spindle is a Mechanical Bakugan that combines with Cyborg Helios or Helios MK2 to form Maxus Helios or Maxus Helios MK2. Although a snake-like creature, it has two massive mechanical claws to shred its challenger. A multiple barrel blaster-ray protrudes from its back, which when fired can eliminate multiple Bakugans. Its body is made up of the latest metallic-fiber that is both light and durable. Purchase Spindle from Amazon now!